- Freud&apos;s Last Session has been extended again, through September 2. 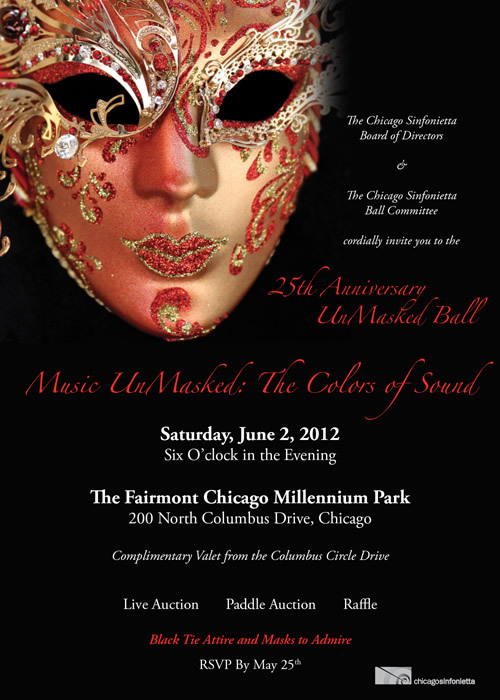 - You can attend Chicago Sinfonietta’s 25th UnMasked Anniversary Ball -- which is black-tie -- called Music UnMasked: The Colors of Sound this Saturday evening. Well, if you RSVPed by May 25 you could have (though it looks like there&apos;s still space). - Porchlight&apos;s Chicago Sings benefit concert will celebrate Jerry Herman on June 18 at 7 pm at the Mayne Stage. On the roster: Sean Blake, E. Faye Butler, Joan Curto, Rebecca Finnegan, Heidi Kettenring, Ross Lehman, Tom Michael, Johanna McKenzie Miller, Meghan Murphy, Peggy Roeder and Bethany Thomas. - Tonight It&apos;s Live with Tom Bambara opens its 5th season at Oracle on June 9, for an erratic run of late-night performances this summer. - Phylicia Rashad and Paul Oakley Stovall will be talking back to you about Immediate Family during a preview performance on June 3 at 2pm at the Goodman; Michelle Boone, the Cultural Affairs commissioner, will moderate the discussion. It "will focus on the evolving portrait of African-American families on the American stage, as well as the cultural shifts challenging today&apos;s family bonds."